The holidays are just around the corner, are you dreading seeing certain family members that press your buttons? Is the idea of visiting people you love for the holidays dragged down by the idea of having to interact with that one out of bounds person that always manages to get under your skin and derail your good time? What if in the same way you planned for just the right wreath for your door, just the right presents for each and every person you love and just the right lights for your tree, you also plan in advance the care for your emotional, mental and physical wellbeing when managing interacting with those difficult people? What if you didn’t have to experience being a deer stuck in the headlights once again with a boundary-crossers’ un-welcomed remarks? What if you can plan for more enjoyment, ease, fun and connecting BEFORE the holidays? You might have engaged in an argument in the past or quietly tolerated what you consider the intolerable and left resentful and exhausted. Both don’t work to move the situation towards the real spirit of the holidays. I start by thinking of what social experiences I have repeatedly had in the past that I don’t want to repeat. I then make a list of what I want more of in my holiday social experiences and lastly make a list of plan B options that will redirect my behavior towards what I want and away from what I don’t want. It can be sticky to not let ourselves get caught up in the emotion that those resilience testers stir up in us and join in the mire with them. It’s easier though when we’re crystal clear on what we want more of and what we will not tolerate in order to move closer to that. 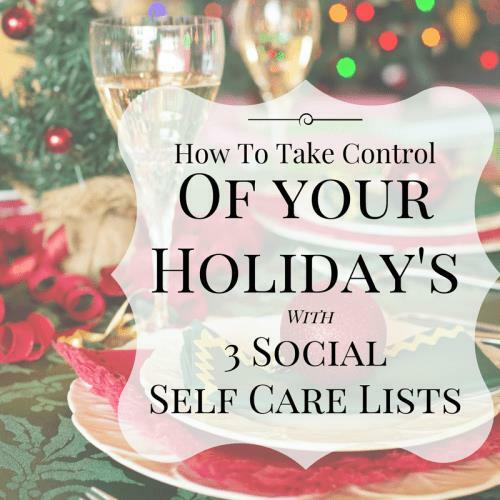 If you are facing a similar dreaded social situation, I invite you to consider trying this list approach and take control of your holiday season. Below are examples of my 3 lists. Now that I know what I want and don’t want I can review what have been all the sticky points in the past and plan in advance what plan B’s I can have in place before they happen. Putting thought into a plan gives me a focal point to continually redirect my thoughts and behaviors towards as I’m in the social event. I have an aunt that likes to have as the topic of conversation my weight and my un-Catholic spiritual practices (I.e. meditation, yoga, chanting etc.) in a critical light. Call a loved one in advance that I love being around that understands and ask for their help in inviting me away from the sticky interaction and into a different circle of conversations. Boundaries can be hard when there has already been a set pattern throughout the years of certain kinds of interactions between you and the other person. I have found that accepting what stresses me out helps I identify my limits so I can then work with them. Saying no to boundary crossing interactions is easier when there’s clarity about our deeper yes. It’s freeing to be able to be ourselves in social situations without having to worry about our emotional safety. In saying no to those insensitive interactions, we say yes to those that nourish us. This is possible when we make it clear to those around us what we will not tolerate and what we will wholeheartedly contribute to.